The Grey Gatsby gets up close home to deny odds-on favourite Australia. An outstanding riding performance by Ryan Moore. Ryan Moore and The Grey Gatsby collared Australia in the final strides to win by a neck. There had been two lengths between the pair when dual Derby hero Australia had been the impressive winner of the Juddmonte International at York. It looked as if Aidan O'Brien's 30-100 favourite was bound for another Group One victory when striking the front inside the final furlong, but Moore had been stoking the Kevin Ryan-trained winner (7-1) along at the rear and swooped on Joseph O'Brien's outside to lead at the post. 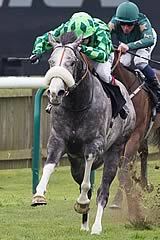 The Grey Gatsby is a Classic winner himself, having collected the French Derby under an inspired Moore back in June. He was one of those in no hurry during the early stages, as Australia's pacemaker Kingfisher and the Hamdan Al Maktoum pair Alkasser and Mukhadram formed a leading pack. O'Brien was forced to go quite wide around the home bend, while Moore saved ground on the inner and used that momentum to take him on to yet another major success. Both horses gave their all but it was just in the final few strides that The Grey Gatsby inched to the front. Trained by Kevin Ryan in Yorkshire, The Grey Gatsby (7/1) had won the Dante Stakes and the Prix du Jockey-Club (French Derby) before chasing home Australia at York on his latest start. Ryan confirmed with the colt's owner Frank Gillespie after the race that he would stay in training next season as a four-year-old. The delighted trainer said: "Ryan went out with a plan. He thought they would go very hard, so he was going to hang on to him. "I said to him that was Plan A, but if he had to revert to Plan B or C, so be it. You don't tell Ryan Moore how to ride. "He's a great racehorse and I'm very proud of him. I've felt all along that he's never had the credit he deserves and if he doesn't now it will be unbelievable. The horse has done his own talking. 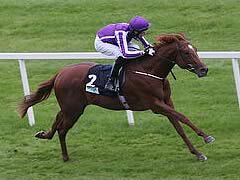 "In fairness, Hughesie (Richard Hughes) said at York that Australia just got first run on him. On the day I don't think he would have beaten him, but Richard thought he would have been a lot closer and given him a harder race. "Today we probably had him in a little bit better shape, as we were always conscious of this race. "Turning in I was thinking 'Oh God, he's got a lot of ground to make up', but in fairness to Ryan he was saving ground while Australia had to go wide. "He made up the ground well and when he passed one and picked up, I thought he would go very close. "He's a horse that has taken us on a great journey, both me and the owner. "He'll stay in training next year and will get stronger and better. We'll hopefully have another great year. "He won't go to the Arc. There's a chance he could go to Ascot on QIPCO Champions Day (for the Champion Stakes) and if he did that would be his last run. "We'll start off next year in the Dubai Duty Free. "He's still young, he's still improving and we want him for next year." SkyBet quoted The Grey Gatsby at 4/1 for the QIPCO Champion Stakes, with Free Eagle, such an impressive winner earlier on the card, a 3/1 chance. The Grey Gatsby had been supplemented for Ireland's premier Flat event and was completing a fine day for the stallion Mastercraftsman, who had also sired the day's Ladbrokes St Leger hero Kingston Hill, also a grey like this winner. Moore said: "He ran a very good race in the Juddmonte, we knew Australia would be hard to beat but he had come on a little bit from York. "The race set up nice for him and he really tries hard. He put his head down and really fought. I'd say both horses have run very good races to pull that far clear of three other Group One winners. "Every race you just have to see how it unfolds and it looked like they'd go fast. "We planned to be patient and to have him where he's comfortable. The horse travels well, you give him a target and he'll chase it. "When he won the Dante I really liked him, and when we went to France I thought he could run well but he surprised me with how well he won and I thought then this is a very good horse. He's proved it today."